In 1968, roiled by racial protests, urban riots, and the Vietnam War, life changed abruptly for Omaha, Nebraska, just as it did for the US. ‘The Rhythm Boys,’ Omaha Central’s great basketball team, unified blacks and whites, players and fans, in its quest for a state championship, which fell one game short owing to events that overtook the importance of the game. Central’s star, Dwaine Dillard, was on an NBA trajectory before his life and the times got in the way. This narrative is partly Dillard’s story, but like all good sports books—and this is a terrific one—athletes and sporting events are keys to understanding broader social issues. Dillard was a troubled young man who was popular with students but lived a double life of drinking, gambling, and boiling resentment at whites, who treated him like a commodity. In 1968, Dillard’s problems continued, as he was booked for taking part in a riot following George Wallace’s presidential campaign appearance. The charges were later dropped, but not before Dillard was suspended from an important playoff game. The resulting stress caused him to play poorly in the 1968 state title match-up. Following that season, Dillard was expelled from school after his basketball career was over and he was no longer “useful.” The player’s once promising professional career lasted just three games for the Utah Stars. Dillard subsequently played for the Harlem Globetrotters from 1974 to ‘76, but quit because of the team’s racially demeaning antics. A downward spiral consumed Dillard through a series of low-level jobs and abusive relationships, and ended with his death from pancreatic cancer at age fifty-nine. 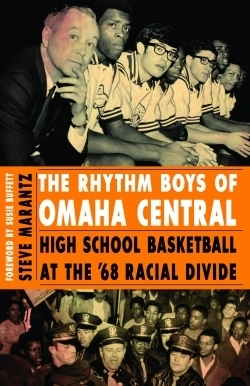 The author, a graduate of Central Omaha, adds personal insight into his book. Marantz has written Sorcery at Caesars: Sugar Ray’s Marvelous Fight, and is currently a researcher for ESPN Content Development and E:60. He cannot be faulted for not shedding more insight into the inscrutable Dillard, who was interviewed for the book shortly before his death. Despite Dillard’s tragic life, Marantz considers him a member of a generation of African Americans whose fight for racial dignity led to the election of the nation’s first black president in 2008, the year Dillard died. As a narrative of an American high school united by basketball and torn apart by the times, the account hits a nothing-but-net three-pointer.